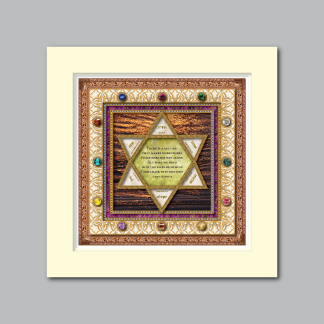 Pillars of Judaism :: "Brotherhood"
The inspiration for “Brotherhood” is derived from the concept of community formed by the 12 tribes of Israel whose stories are found in the Five Books of Moses. The outer frame displays an intricately carved border that reflects an inter-connectedness of design. The main border features 12 different precious gemstones surrounded by filigree that represent each of the brothers born of our matriarchs Leah and Rachel. Highlighted on royal purple are the names of each tribe. These repeat over and over completing a never-ending cycle. The central background image, like liquid bronze, reflects waves on the shore and the unrelenting tide. 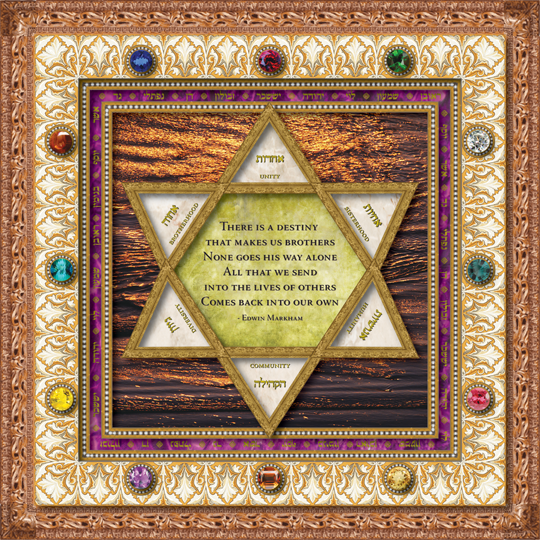 The Mogen David (or Star of David) encircles an excerpt from a poem by Edwin Markham. These written words remind us that we are all connected as part of humankind. How we choose to live our lives in small or large ways effects all those around us. 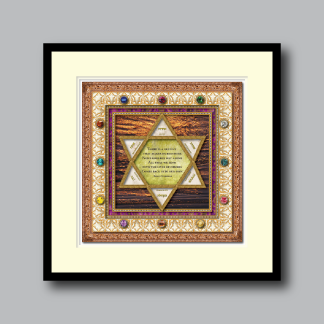 In the open points of the Mogen David are the words in Hebrew and English that remind us that we are all members of the brotherhood and sisterhood of the human race. These words beg us to strive for tolerance and respect for diversity in all humanity. In the holy book of Exodus it is written that each of the 12 tribes took their specific place of honor surrounding the Tabernacle and Holy of Holies as a unified community. We are tasked with creating a sense of unity within the community of the world.